No other gem or jewel fascinates us girls like the Diamond. The shining brilliant light hypnotizes us with its radiance. 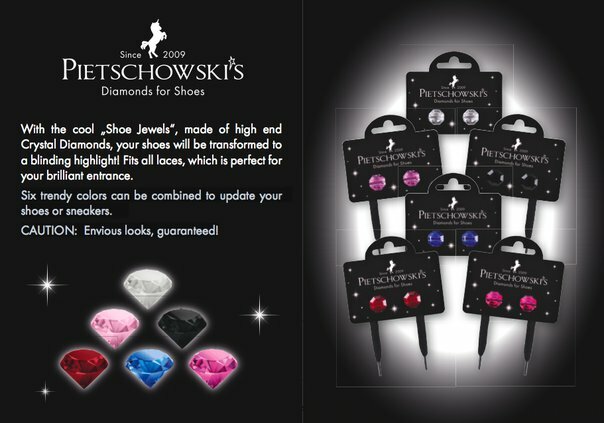 With Pietschowski’s Diamonds for Shoes, your shoes will be an absolute stand out and make a real impression. Let these beautiful shining stones of crystal inspire you with their shimmering light! With six trend colors, you can update your look, on sneakers or any laced shoes, these “eye catchers” fit on all laces. Simply lace the Diamonds onto your shoes, and step into a bright future, leaving the dull behind. Follow your passions, and let your shoes lead you on a colorful path.